We are delighted to confirm the presentation of a Special Award to Sir Run Run Shaw CBE, in recognition of his outstanding contribution to cinema. 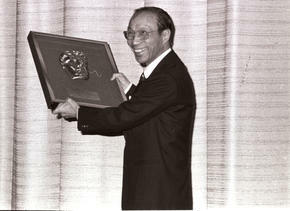 On 3 December 2013, BAFTA presented a Special Award to Sir Run Run Shaw CBE, founder of the globally recognised Shaw Studios, in recognition of his outstanding contribution to cinema. The Shaw Brothers produced over 1,000 films, acquired and developed cinemas around the world, and invested in a number of co-productions, most notably the classic Blade Runner, directed by Ridley Scott. Darren Shaw, great nephew of Sir Run Run, collected the award on his behalf at an Academy Circle event for local supporters of BAFTA’s charitable mission in Asia, at The Peninsula Hong Kong. 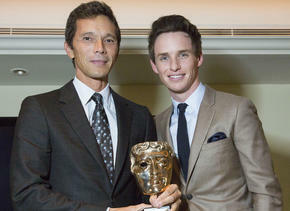 BAFTA/James Guan Yue Darren Shaw accepts Sir Run Run Shaw's Special Award from actor Eddie Redmayne. 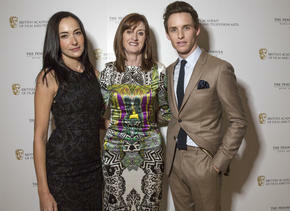 BAFTA/James Guan Yue Television presenter Lisa S, Amanda Berry and Eddie Redmayne. A historic moment for BAFTA: At 106 years old, Sir Run Run Shaw is the oldest recipient of a BAFTA award, and it also marks the first time a Special Award has been presented in Asia. Amanda Berry, CEO of BAFTA, said: "We are excited to be expanding our successful scholarship programme to Hong Kong residents and to be giving UK nationals the chance to learn from their colleagues in Asia. It is wonderful that, at a time when we are supporting the future of our industries through cross-cultural collaboration, we can also celebrate our historic links with the region through Sir Run Run Shaw, whose own generous donation in the late 1970s helped BAFTA grow into the organisation it is today. At the time BAFTA paid tribute to his generosity by naming a theatre at our London headquarters in his honour, which still bears his name." In 1977, Hong Kong cinema legend Sir Run Run Shaw CBE gave BAFTA a sizable donation to help develop a permanent site for BAFTA members to meet and enjoy screenings and industry events in professional, all-purpose built surroundings. In recognition, we named one of our theatres after him. 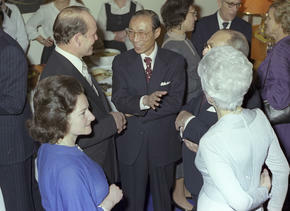 The Run Run Shaw theatre was opened in March 1978 by then BAFTA President HRH Princess Anne in the presence of Sir Run Run, and is still very much in use today. The room at BAFTA’s headquarters - home of its 6,500 worldwide membership, serves as a permanent marker of our affiliation with Asia, and the Hong Kong film industry. Read the original letter written by then Academy President Lord Richard Attenborough, in which he announces 'with the greatest possible pleasure' the naming of BAFTA's Run Run Shaw Theatre. To learn more about BAFTA's Special Award presentation to Sir Run Run Shaw, read the official announcement press release.